The Big Read: With the stench of mismanagement, many have prematurely proclaimed the death of public-service broadcasting. 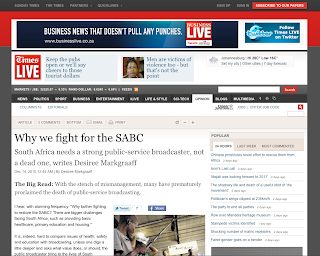 I hear, with alarming frequency: "Why bother fighting to restore the SABC? There are bigger challenges facing South Africa, such as providing basic healthcare, primary education and housing." It is, indeed, hard to compare issues of health, safety and education with broadcasting, unless one digs a little deeper and asks what value does, or should, the public broadcaster bring to the lives of South Africans. Unlike many of the other challenges our country faces, public television and radio is the one service we can give almost equally to all immediately - and through it we can speed our delivery on education, not only curriculum, but also the many other nuanced forms of education, such as life skills, cultural understanding, tolerance and respect for language. We use it to restore dignity by telling the stories of all our people in a way that validates and shows respect. We use it to collate our history and keep it alive and relevant. And don't underestimate the value of pure entertainment - making people laugh and encouraging time for families to be together. We use radio and TV to stimulate and provoke conversation about ourselves as a society, as a country. In all the debates about the SABC and what to do with it or to it, the one I hear least is: How do we ensure we are doing what the South African public wants? There is plenty of evidence to prove that the public broadcaster plays a vital role in our country and is loved by audiences. Just think of the popularity of programmes such as Soul City, which consistently achieves high audience ratings and is clear evidence that entertainment and education can be merged. HIV/Aids statistics indicate infection rates are starting to fall, condom use is on the rise and prejudice is decreasing. This would not have been possible without the information provided by Soul City, Isidingo, Tsha Tsha, Intersexions and others on SABC radio and TV. Or what about languages? There is little available in print or on commercial platforms in the many languages of South Africa. Without the SABC, especially radio services that broadcast in minority languages, these languages will slowly die and with them a valuable part of our heritage because they are not financially viable for commercial broadcasters. Does that mean they are not important to our society? Of course not. The importance of education, language, history and such on the public broadcaster is often used as an argument for why the SABC should get more money from the government, or for why it ran into financial trouble. I do not agree with this.